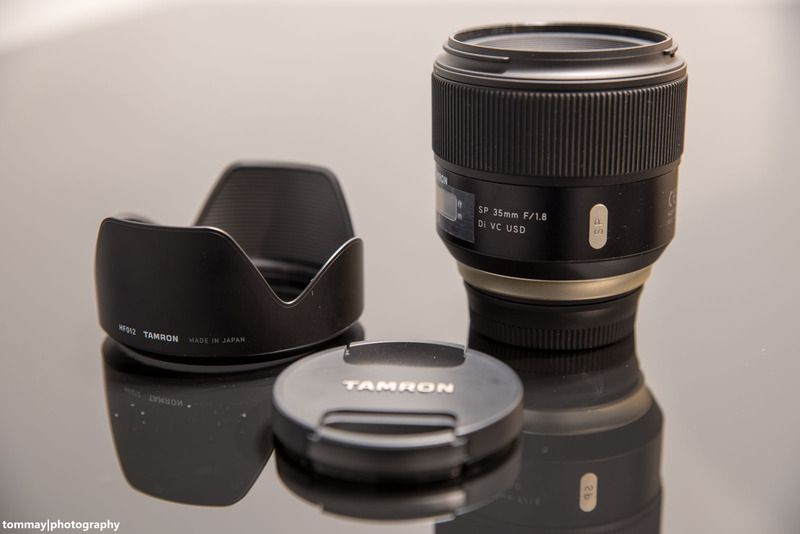 In today’s blogpost I want to write about the second Tamron prime lens. Last weekend I had the opportunity to shoot with the Tamron SP 35 F1.8 VC USD. My thanks go to Photostore Werkgarner in Wels for this chance! In terms of build and image quality the second lens of the new Tamron SP lens line is excellent and I recommend reading my review of its sibling, the Tamron SP45 F1.8 VC USD, since these points are nearly identical. Here I want to show up the few differences between these two lenses. The first difference is of course the focal length: While the Tamron SP45 F1.8 VC USD has a focal length of 45 mm, the Tamron SP 35 F1.8 VC USD has 35 mm. You do not get this natural look with 45 mm but a more wide angle look (on full frame cameras of course). Somewhere between 35 mm and 45 mm there is a breaking point with a significant change of the visual effect. The 35 mm lens is 10,9 mm shorter and it’s 70 grams lighter than the 45 mm lens (Nikon F mount version). The 35 mm offers a XLD glass element (eXtra Low Dispersion) which should help with color fringing, but I didn’t notice any difference in this regard. It also produces C/A like the 45 mm lens. The minimum focus distance (MFD) of 0.2 meters is even lower than the MFD of the 45 mm lens. It offers a magnification ratio of 1:2.5. The lens is therefore able to create stunning close up shots. The image stabilization system (VC) is not as effective as in the 45 mm. I was not able to capture sharp pictures handheld with shutter speeds lower than 1/10 sec (with the 45 mm, I managed to take sharp pictures down to 1/6 sec.). Maybe the size of the lens matters and the VC system does not have enough place to work effective in the 35 mm lens. The flare resistance of the 35 mm seems to be better, as I was not able to create any pictures with flares on it. The Tamron SP 35 F1.8 VC USD is a very good prime lens. In terms of image quality it is nearly identical to the 45 mm lens – very sharp, good colors, smooth and creamy bokeh. Whether you should buy the 35 mm or the 45 mm lens totally depends on your shooting style – so you have to decide yourself. I hope I could help you with the choice by showing up the differences. I can recommend both lenses due to the great quality Tamron delivers. The price is also identical to the 45 mm lens: about 599 $/600 £/730 €. You find full size sample images in my Flickr album here! The first sample images you find in the blogpost about my evening walk in Wels. As the image quality is identical to the 45 mm lens I will post only edited sample photos here.